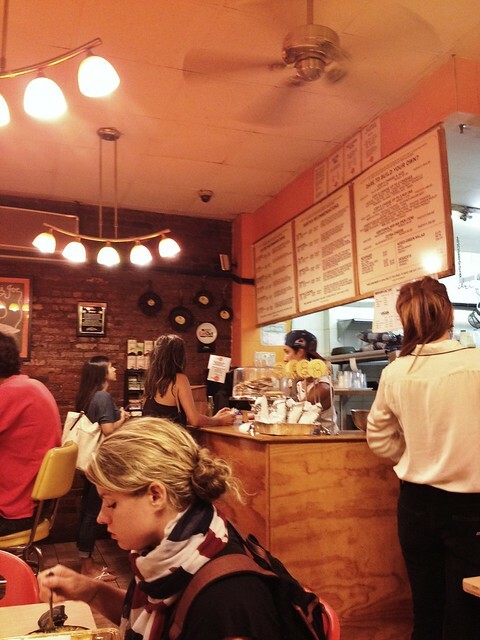 Last week, Jess and I got our fix of macaroni 'n' cheese over at S'MAC (which stands for Sarita's Macaroni & Cheese) in the East Village. This beloved comfort food joint was created by husband-and-wife team, Sarita and Caesar Ekya. 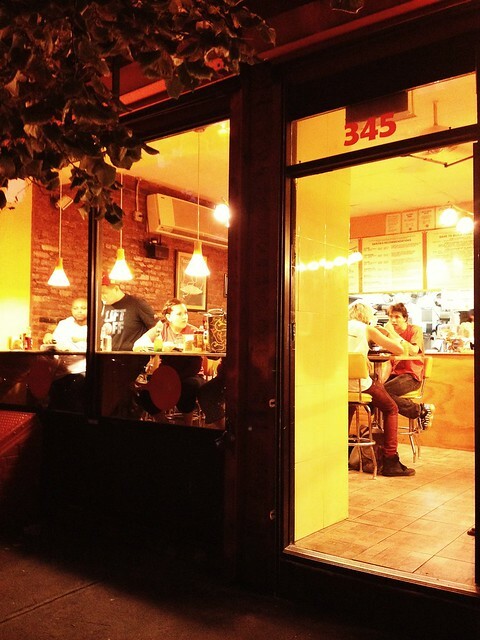 When they were eating one day at Peanut Butter & Co. (another comfort food-centric restaurant in the West Village), Mrs. Ekya wondered (in a half-joking, half-serious way) how cool it would be if there were a place that served PBJ, grilled cheese, AND mac 'n' cheese. They both laughed and went on their way, but for some reason, the idea couldn't be shaken, and nine months later, in 2006, Mr. and Mrs. Ekya opened up S'MAC, serving up ten variations of mac 'n' cheese. 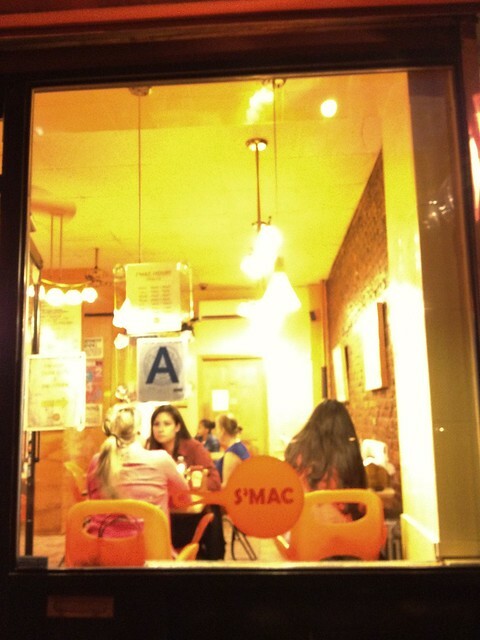 Inside S'MAC -- very bright oranges and yellows (fittingly so, of course). Even the ceiling light fixtures resemble elbow macaroni! The cast iron skillet pans hanging on the wall delineate the different sizes offered at S'MAC. The smallest is Nosh, next sizes up are Major Munch and Mongo, and the largest size is Partay! We had no idea that the Nosh size would be THAT sizable (especially with the price), so we decided to err on the side of caution and ordered that size. All of the mac 'n' cheeses come with a generous sprinkling of bread crumbs. There is also a "make-your-own" option as well, so you can get pretty creative if you want to! Jess decided to go the classic route, and ordered the All-American ("nostalgia at its finest") with a blend of cheddar and American cheeses. 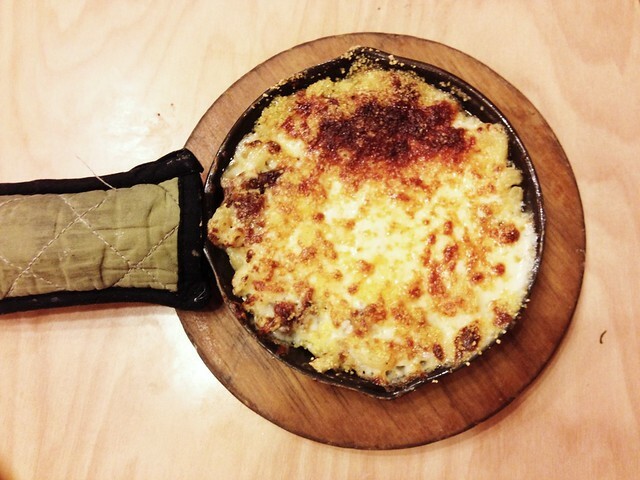 The mac 'n' cheeses at S'MAC are casserole style (just how I love it), and the combination of breadcrumbs and cheese covering the macaroni creates a really nice and delicious faux-crust. It's crunchy, toasty, and cheesy, providing a great textural contrast to the creamy and soft cheesed macaroni. It also comes scorching hot in those black, cast-iron skillets with a quilted potholder and a wooden trivet. With that being said, the All-American is the no-nonsense version on the menu -- just straight up cheese and elbow macaroni -- which is ideal for those who are purists of this comfort food form. I decided to try something a little different, so I went with the Alpine with Gruyère and slab bacon. The aforementioned crust is nearly mind-blowing, and the combination of Gruyère and bacon was fantastic. This might be one of those really? things to complain about, but the slab bacon (I should've known from the description right there) was cut really thickly and spread out unevenly, so it was hard to gauge whether I'd have enough bacon to go with each bite of cheesy macaroni. But really, did I have much to complain about? I mean, it was HUGE chunks of bacon after all. Findings: Overall, I think there is some delicious stuff cookin' over at S'MAC. Its location is perfect, attracting the hangover crowd as well as college students (and let's face it, any reasonable adult) yearning for that childhood indulgence. 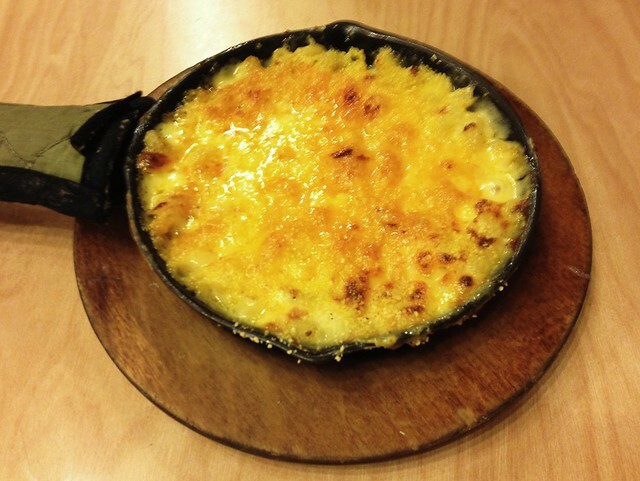 Satisfying for the stomach and very easy on the wallet, S'MAC offers an array of different kinds of mac 'n' cheese, spanning all kinds of cuisines bound to appeal to any hungry palate. When comparing it to the other mac 'n' cheese haven, macbar, in SoHo, I would say that I like the breadcrumb crust better at S'MAC while I prefer the gourmet selections at macbar (as it's more fitting to my own tastes). Either way, they're both solid places to find a generous helping of mac 'n' cheese at a decent price for any jonesing that may occur late at night. Definitely adding this to my list of late-night cheesy binges (plus, Artichoke Pizza is around the corner). Price point: $4.75-7.25 for Nosh-sized macaroni and cheese. Great place to get your fix of macaroni-and-cheese. They have the classic All-American or others with nuances inspired by other international cuisines. You can even make your own!